Louisiana’s oak tree species grow in many habitats within the state, featuring a wide array of leaf shapes and sizes. These oaks occur in upland sites throughout the state as well as in the moist lowlands. Louisiana’s oak trees possess an assortment of sizes, from the smaller shrub-like turkey oak to the majestic live and potentially enormous live oak. These trees are important parts of the Louisiana countryside. Many types of oak trees grow throughout Louisiana. Among them are the Nuttall oak, southern red oak, black oak, Shumard oak and the blackjack oak. Other types include the post oak, live oak, overcup oak, cherrybark oak and the laurel oak. The willow oak, sawtooth oak, swamp chestnut oak, water oak and the turkey oak are also present within the state’s borders, according to . The live oak is a symbol of the Deep South and an important ornamental species. Often draped with Spanish moss and possessing evergreen qualities, this oak tree commonly grows from 50 to 60 feet, but can reach 85 feet. The spreading canopy of a live oak may be as wide as 100 feet, with many of the lower branches actually touching the ground. Although live oaks appear to be many hundreds of years old, The Louisiana State University School of Renewable Natural Resources website notes that most only live for 200 to 300 years. Oak species within Louisiana are important parts of the state's ecosystem, providing wildlife with a source of food and with places to live. One example is the bluejack oak, a tree that grows in the pine forests and hardwood forests of the state. The acorns this oak produces become forage for the white-tailed deer, raccoon, chipmunk, squirrel and innumerable birds, such as the bobwhite quail. In addition, the bluejack oak typically forms thickets of small trees, giving creatures cover and opportunities to build nests within them. People will use a bluejack oak’s wood for such purposes as fence posts and barbecue fuel. Louisiana has some oaks that are either evergreen or semi-evergreen, losing their leaves only when replacement foliage grows in, keeping the tree always looking “alive.” The live oak is one, while species such as the water oak and the laurel oak are others. The “National Audubon Society Field Guide to Trees” describes the laurel oak as “nearly evergreen,” stating that the leaves stay on the branches all the way through the winter months and do not come off until the first weeks of spring, as new ones quickly grow in to take their place. The shapes of the oak leaves in Louisiana are many, with some closely resembling each other and others looking like the leaves of other tree families. Types such as the white oak, overcup oak and black oak have the multi-lobed appearance of many of the northern oaks, but the willow oak has foliage that is narrow and long, looking more like that of a weeping willow than a typical oak. 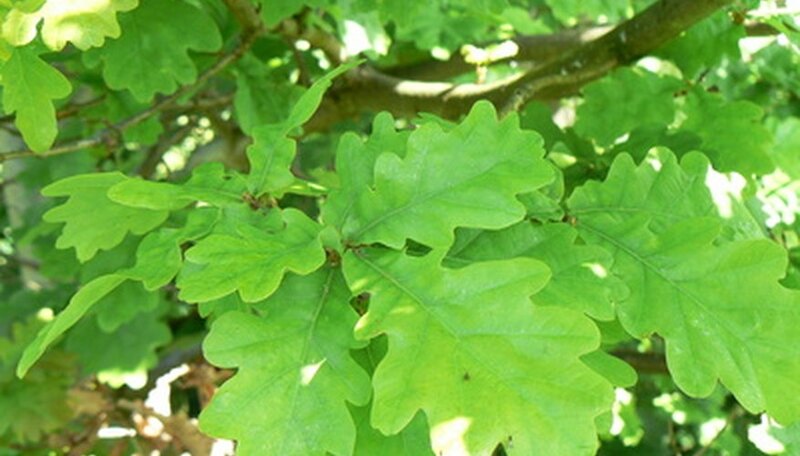 The leaves of the blackjack oak have a shape similar to a kite, while the leaves of the swamp chestnut oak are oblong, with wavy teeth along the edges.